Lacking any true artistic talent I am forced to borrow heavily from others. I find myself forever snipping little bits of images here and there and then squirreling them away. Like everyone I can’t resist a beautiful photo but I also find myself drawn to the artwork on packaging. Who knew seed catalogs and hard cider bottles could be such a goldmine? I once framed the cover of an old Garden Botanika catalog. Don’t get me started on cancelled postage stamps. Haven’t you ever saved a card simply because you loved the art? This snippet hoarding began when I first read Julia Cameron’s The Artist’s Way back in the late 90’s. Again, I’m not an artist but the book is chock full of exercises to awaken one’s slumbering creativity. Week Seven is my favorite because it is Collage Week. Julia makes you rip images from a stack of magazines and then make a collage from them. It is imperative that you not over-think this exercise. These collages are a blast to make and I find I have never been able to break the habit of saving an image that appeals to me. I find I rarely buy magazines any more in this digital age but that makes me wonder if package art has stepped up its game and filled that void in grabbing one’s attention. (As much as I hate to admit it the St. Pauli Girl people figured out years ago that a little cleavage sells a lot of crappy lager.) I started buying hard cider a few years ago and I am not kidding about the label art sucking you in; go find a bottle of Oliver Winery’s Bean Blossom hard cider. These labels don’t necessarily have beautifully rendered apple paintings but all can easily differentiate from each other on the shelf. My point? I don’t really have one except to illustrate how an inspiring image can come from anywhere. You just need to go with that feeling. 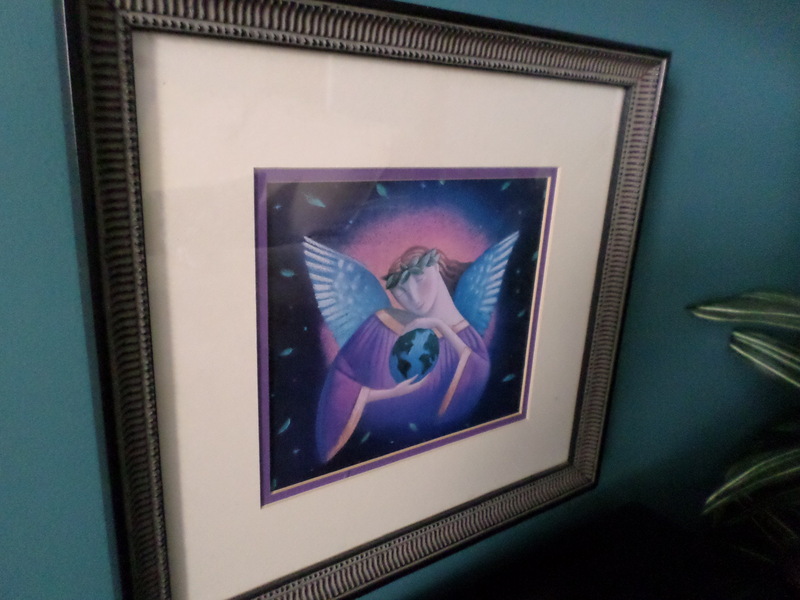 How does one deal with all of this mini-art laying about the house? With this month’s DIY project: collages, of course. Hung next to my work table for inspiration this oversize cork board groups a bunch of items — a sort of collage of collages. 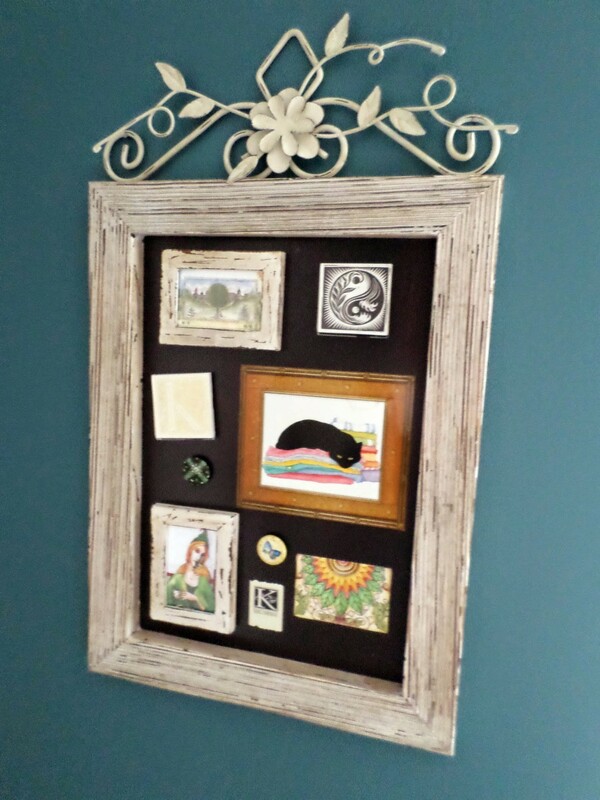 The framed art (a couple of paintings, a couple of photos, a postcard) are hung with long nails driven through the cork and into the wall. The magazine rack on the lower left, also mounted through cork into drywall, holds a collection of small collages I’ve made over the years. The tray on the lower right is a mandala I made about 15 years ago based on some now-forgotten book. 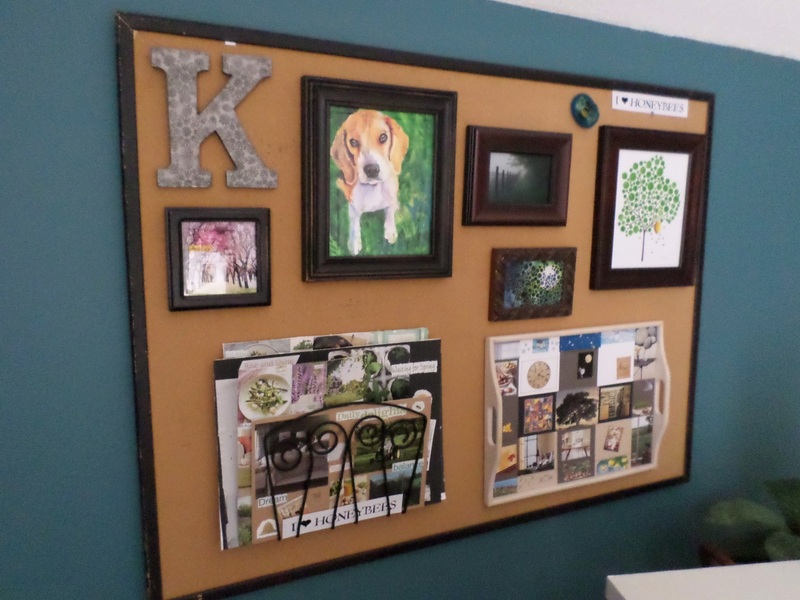 There are some other odd pieces here but the cork board keeps them all corralled in one spot. This is a nifty little magnet frame I got at Pier One. It has a dreamy metal back that showcases little pieces: a couple of gift cards, a sweet yin and yang drawing, some buttons, a few things snipped from a magazine. I make my own magnets by taking the paper art and applying it to adhesive magnet stock and then trimming to size. Another Pier One find, this is a metal desk easel. It has a tray along the bottom that is great for stuffing all manner of paperwork. 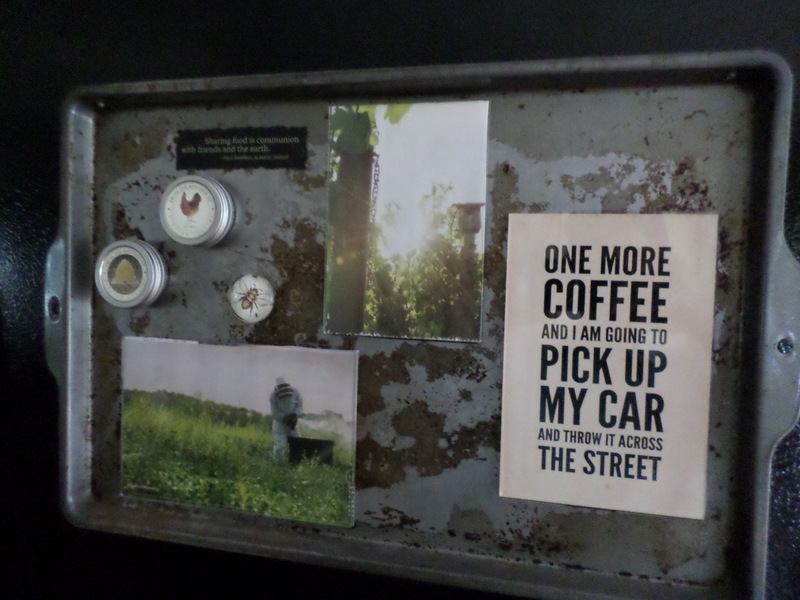 A few more homemade magnets adorn this collage. This old baking sheet belonged to a friend who was horrified that I wanted it for a display. I love its patina. It clings to my freezer door with super duper magnets on the back and on the front I used a few acrylic magnet frames for magazine photos and a postcard. During the holidays I put my favorite Christmas cookie recipes in the frames. It features a few more homemade magnets made out of tins and buttons. Also, I have a coffee consumption problem. There are other magnet collages around here, but I think you get the idea. I love how interchangeable they are since you use magnets instead of glue. 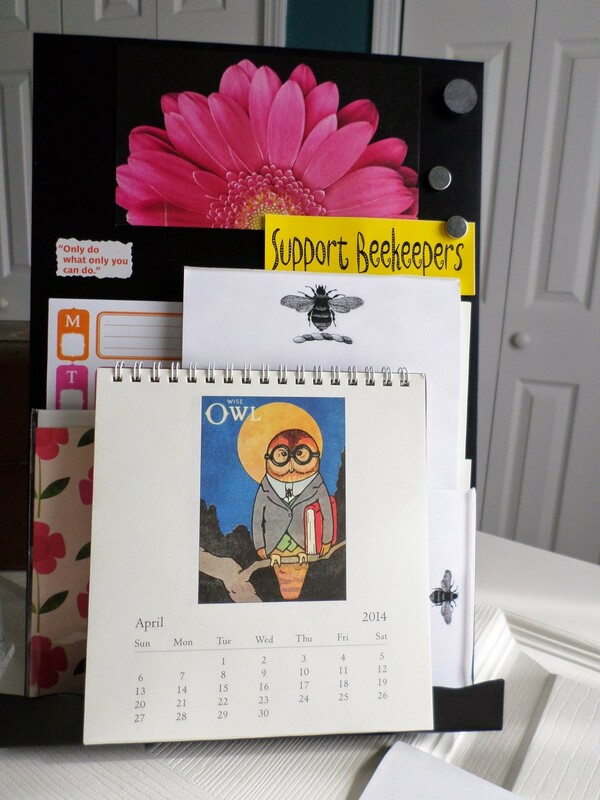 It is easy to do a collage for the seasons or hobbies or dinner menus or, yes, even your fave photos. My thanks to Garden Botanika. What crafty ideas! I don’t think you can truthfully say that you are lacking in artistic talent. Your collages show a lot of creativity. Thanks Linda…I can’t recommend The Artist’s Way enough; it is work that feels like play.